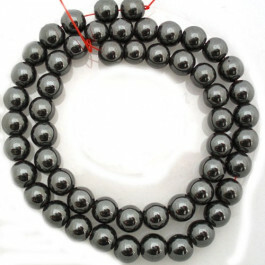 A-Grade Hematite Stone Round 8mm (50pce Strand) - 40 cm /16'" Strand Deep black with a metallic shine. Polished Hematite was traditionally used for magic mirrors which had the power to reflect back negativity. Roman soldiers were believed to rub the red powdered hematite on their bodies to make them invulnerable. Like most of the hematite on the market, this is Hematine is a simulated material virtually identical to real hematite. It even has the same chemical composition - both genuine and simulated hematite are iron oxide. True hematite leaves a red streak when scratched across a piece of unglazed porcelain, while the simulated products usually leave a gray streak. The simulated material is much easier to form into detailed shapes, and still looks and feels like the real material. "Hematine," "hemalike" and "hemalyke" are common names used for this product. If you look closely at the hole in a molded bead of simulated hematite, you will often see a smoothly curved hole rather than the slightly chipped and sharply defined edge of a true drill hole. The holes are usually molded into the bead.